In the "Poggio Oliveto" farm guests can visit the cultivations or actively take part in the country life, with all its rhythms and seasons: the grape-harvesting, the olives picking, the maturing of strawberries and melons. The farmstead extends for 115 ha including: 40 hectares of olive grove, 24 hectares of walnut orchard, 10 hectares of fit for seed land and 5 hectares of land allocated to the garden centres and to the greenhouses for the horticultural production. The remaining hectares are made up by Mediterranean scrub and a coppice in which cork-oars are dominant. 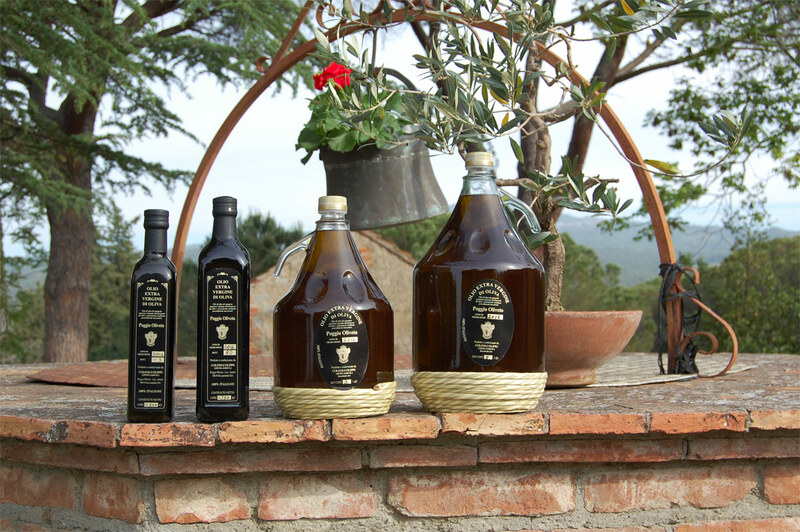 Another genuine and of high standard quality product is the "Poggio Oliveto" olive oil: it is obtained from the cold pressing (carried out with the typical millstone) of Moraiolo, Leccino and Correggiolo olives, all coming from the olive grows of the hills overlooking the "Maremma grossetana". The particular kind of "cultivar", the drawing technique, the natural separating process without filtering, create a dull- coloured, pale green oil with yellow glints, defined by a medium scent with grass-like smell and a fruity flavour reminding tomato and almond: a very high quality product meant for a few connoisseurs. Inside the firm there is a comfortable room where it is possible to taste and buy the typical products of the farm.